This canoe tour passes through the lovely Lentua lake system, a network of lakes dotted with islands large and small and connected by rivers and small lakes with winding passages and short rapids (which are easily bypassed with short land transports). You spend your days exploring this beautiful area and at night wild camping at a wide choice of designated camping areas with wind shelters and fireplaces where wood is provided. The clear waters offer wonderful opportunities for swimming from gentle, sandy beaches to cool off after enjoying a hard day's paddling! Taking time for some fishing during the tour is a popular option. Photo: Mark Dixon. You will be canoeing through thick Taiga forest rich in wildlife, with relatively little sign of civilisation/few settlements along the way, giving a real sense of remoteness during many parts of the tour. Much of the area is protected and the majority of islands are uninhabited, except by the local wildlife of course! The Tar Route route was used to transport barrels of tar derived from the Taiga forest from the Eastern border to a port for the Baltic Sea. 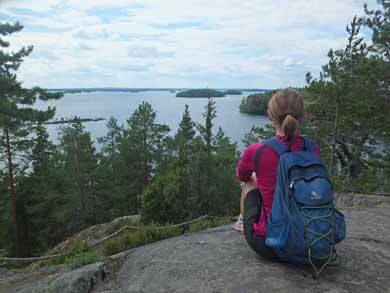 You will explore a section of this remote yet accessible area, paddling south to Kuhmo. 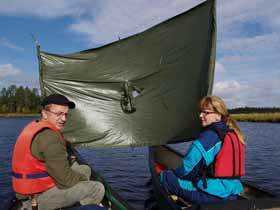 Canoe on the Tar Route in Kainuu is suitable for adults and families with older children (recommended min. age 12, younger children possible by arrangement) - as a flexible tour you can make it as challenging or relaxing as you desire. 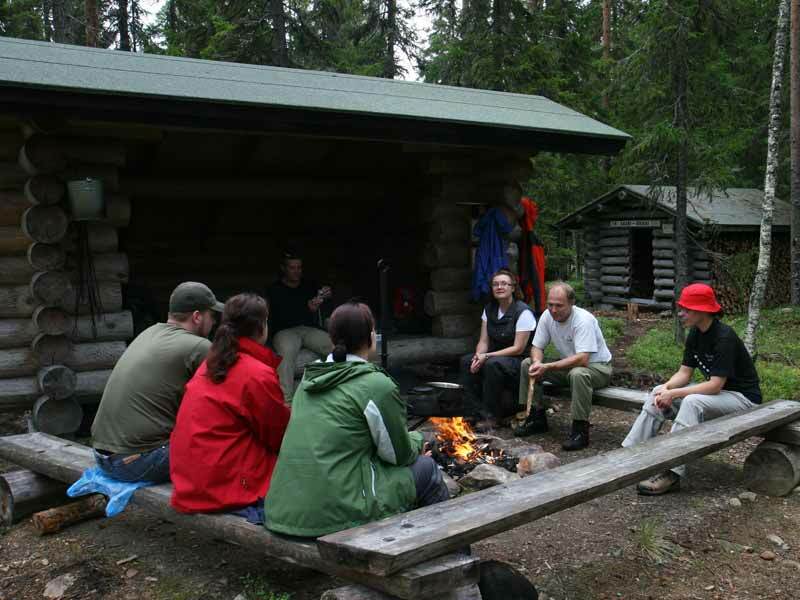 There is an extensive network of overnight camping spots with fireplaces and shelters. Photo: WP. Explore the protected area of Lake Lentua, enjoy lunch on a deserted island or spend some time fishing. You may wish to stop on Lentosaari island, where there is an open wilderness hut and even the chance to stop for a sauna! 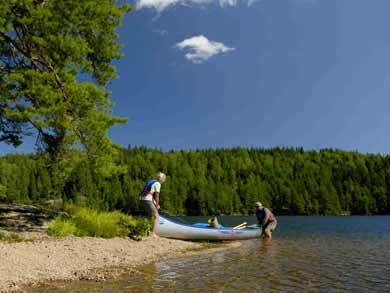 You paddle a minimum distance of 60km to Kuhmo but you can extend your tour as much as you like to discover the lake system's hidden treasures or even spend a day or two on land to go hiking. The tour also offers very good possibilities for fishing, especially for perch and pike, and equipment is available to hire as an optional extra. If you wish to stay locally for extra night(s) before and/or after your tour, a simple wilderness lakeside cabin with rowing boat included is available as an optional extra. Canoes used are 2-person Canadian canoes. Odd numbered groups will normally travel as even number in a canoe with the additional person in single kayak. For odd-numbered groups including a child, the child can travel as 3rd person in canoe. Meet in Kuhmo (start time between 09.00 and 18.00 by arrangement). You will receive your equipment and some guidance on suggested routes to take before transfer to the start point (approx. 45 mins) to begin your tour. There is some flexibility in exact start point for the tour depending on factors such as the duration of the tour and your preferences, but tours will normally start near Lentiira and you will paddle back towards Kuhmo. You will have the opportunity to discuss the most suitable drop-off point for you on arrival. Your canoe tour takes you through a series of lakes connected with river sections and some short rapids. Rapids (100m-400m) are easily bypassed by short carries or using the rail/trolley system provided at certain points to assist with land transports. The area offers many route choices to explore the lakeland landscape and as a protected area you will find few settlements/houses, offering a real taste of remoteness during many parts of the tour. Spend the nights wild camping at one of the many designated camping spots where you can find wind shelters and fireplaces. 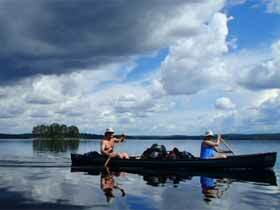 You paddle your way to Kuhmo, where you will end your tour and return your equipment. Start any day by arrangement between 16th May and 20th September 2018 between 09.00 and 18.00. Tour durations are typically 4-8 days but longer tours are also possible. Note that you should be prepared for cooler conditions when paddling at the start/end of the season. Please note that price for transfer to start point must be added to all bookings. For additional adult in odd-numbered group, extra tent is provided. Additional child in odd-numbered group will share tent. Price for single kayak applies for additional adult in odd-numbered group only. If more than one member of your group wishes to paddle kayak, please contact us for details and prices. Tour durations are typically 4-8 days but longer tours are also possible. Please contact us for price information for tours longer than 8 days. Wilderness Cabin before or after tour: See image below. 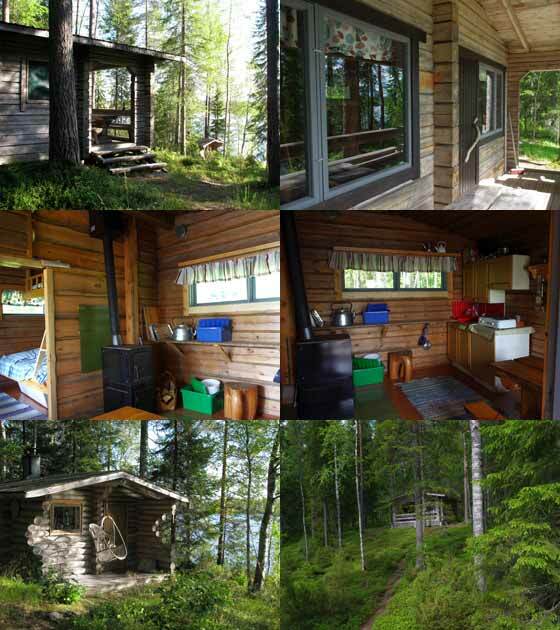 If you wish to extend your stay in the Kuhmo area before/after your tour, this simple wilderness cabin is an ideal option for a real "back to nature" experience. Located on a wooded hillside on the shore of Lake Rastinjärvi approx. 20km from Kuhmo (and 1km from your host's house) with use of rowing boat included, the cabin has wood-fired sauna and sleeps up to 4 persons in one room with 2 x bunk beds 120cm and 160m wide with extra bed available. The cabin is suitable for up to 4 adults for 1-2 nights or a family of 5 for longer stay. The cabin has no mains electricity or running water, but there is solar power for the fridge and to charge mobile phone/laptop. Heating is by wood-burning stove and a simple gas ring provides cooking facilities. Wood is provided for heating the cabin and sauna. There is a dry outside toilet. The lake offers very good opportunities for fishing. 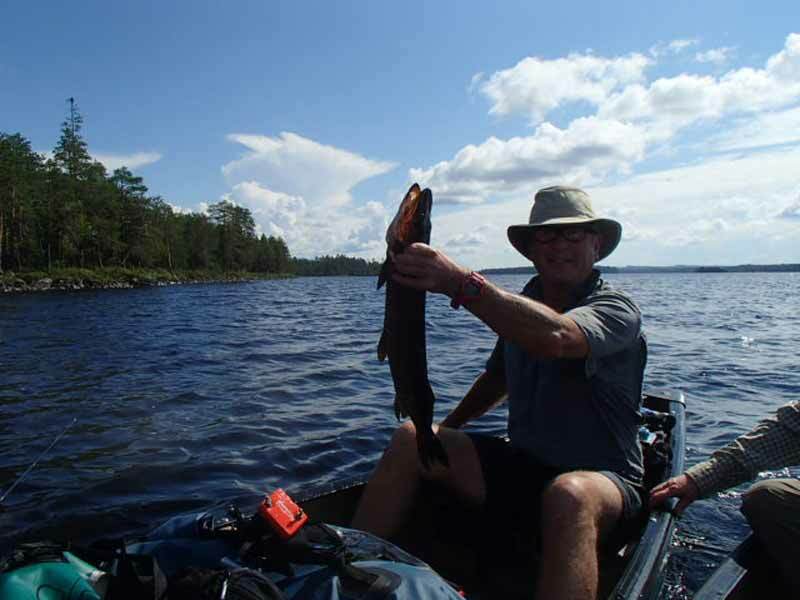 The fishing equipment available to hire for canoe tours can also be hired for cabin stays. 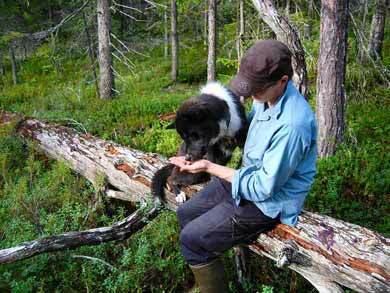 You will need to purchase provisions for your stay in Kuhmo before transfer to the cabin. Bed linen for wilderness cabin (required for stays >1 night): Blankets are provided in the cabin. For stays of one night, you can use the sleeping bag liner that you will have with you for your canoe tour. For longer stays, bed linen should be added. 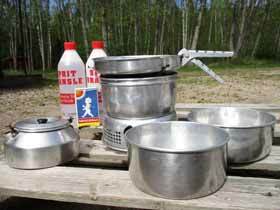 Extra Trangia (if required for odd-numbered person): Trangia stoves are included as standard one per two persons. If you require an additional stove (e.g. if travelling as 5 persons and wishing to have 3 rather than the included 2 stoves), extra stove can be hired as optional extra. Fishing equipment: See image below. 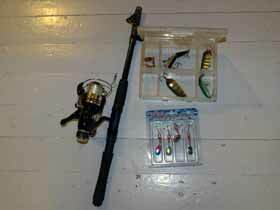 Includes casting rod + 10 lures (note that lures must be replaced if lost, price €3-€7/lure). Fishing licence is required (purchased locally) if fishing with lures, price around €17/week. If fishing with line only, no licence is required and line, hook, bobber and worms can be provided. Perch (up to 500g) and pike (up to 2kg with equipment available or up to 8kg with own fishing gear) can be caught the whole summer. In warm weather, pike perch are also possible. Roach are also commonly caught. It is possible to fish for trout in the local rapids for additional licence fee of €20/day. Transfer Kajaani-Kuhmo-Kajaani: In addition to options to travel by bus, taxi or airport taxi, subject to availability transfer from Kajaani or Kajaani airport to Kuhmo can be offered. Price €125/one-way for up to 4 persons, additional person €25/person/way (max. total 6 persons). Cost for transfer is paid locally on arrival. Transfer to start point for larger groups: If you are a group of more than 8 persons, you will require a second transfer to your start point for each additional group of 8 persons. Standard transfer price applies. Canoe equipment: 2-person Canadian canoe (canoes used are typically Bell Northwind, Swift Dumoine or Nova Craft Prospector), paddles, buoyancy aids, waterproof containers. Child travelling as 3rd person in canoe will have extra seat/paddle/buoyancy aid. Kayak equipment (if adult in odd-numbered group): Single kayak, paddle, buoyancy aid and spray skirt. Kitchen equipment: Trangia* cooking stove (one litre fuel/week is included). NB: Note that Trangias are suitable for 2-3 persons and therefore for odd-numbered groups, an additional Trangia is not supplied (e.g. 2 Trangias are supplied for 5-person group). Camping equipment: Tent (number/type provided depending on group size, models vary e.g. 2-person tent Jack Wolfskin North Bay II or similar, 3-4 person tent Hannah Serak 4 or similar), 3-season sleeping bag (please bring own liner), pillow and foam sleeping mat. Maps: Two waterproof canoeing maps. Instructor: Introduction/assistance in planning your route before your tour starts. Please be careful with the canoe and the rest of your equipment! If some part of the equipment should break as a result of misuse or carelessness, you may be charged for the damage caused. Please see "Optional Extras" below. There is no food included. You must bring all food needed during the tour with you from the beginning as this tour runs in a remote area with no opportunities to buy food along the way. Provisions can be purchased in Kuhmo or from a small store near the start point. Swimming ability required by all participants. Minimum 2 adults. You should be in good health with a good general level of fitness and strength and enjoy the outdoors. Recommended minimum age 12. The canoe tour runs through a series of lakes connected by sections of river and short rapids. Rapids should be bypassed by foot by carrying the canoe or using the trolley/rail system available at certain points to assist with land transports. Note that paddling on lakes can be challenging in windy conditions and you should consider carefully the best side of the lake to paddle on and be prepared to adjust your itinerary depending on weather conditions. The area is quite remote and outside high season you may see few other persons during your trip, but has a network of camping locations and also rails provided for some portages. Total distance paddled and route is taken is flexible. In windy conditions, the lakes can be choppy and paddling more challenging. Fly to Helsinki for travel by train (6 hours) or domestic flight (1 hour 15 mins) to Kajaani, before onward travel by bus, taxi or transfer to Kuhmo (1.5-2 hours).